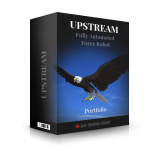 How does the "Upstream" Expert Advisor work? Forex Expert Advisor "Upstream" EUR/JPY, EURUSD, GBPUSD, AUDUSD based on two Moving Average Indicators. Firts one - Slow Moving Average Indicator, second -fast Moving Average Indicator. Moving Average is a type of finite impulse response filter. A moving average is commonly used with time series data to smooth out short-term fluctuations and highlight longer-term trends. Slow MA used in expert advisor "Upstream" to smooth out long term trend, fast MA to smooth out short-term trend.